Preheat oven to 325. Toast pecans for 8-10 minutes. Remove and cool. Preheat oven to 350. Line baking sheet with parchment. Mix wet ingredients in a small bowl. Add wet to dry and mix with a spoon until it starts to come together. Use your hands to mix it completely, just until all the flour is mixed in. Don't overmix. Divide dough in half and place on prepared baking sheet. With the palm of your hand, press down each half to flatten. Cover with parchment and roll each half into a rectangle, about 6x10, and 1/4-1/2 inch thick. Score the logs with a knife and bake for 30 minutes. Remove from oven, reduce heat to 325, and cool for 5 minutes. Slice along score lines (3/4-1 inch strips). Gently flip piece onto one side and bake at 325 for 10 minutes. Remove from oven, flip, and bake another 5 minutes. Repeat once or twice more until they reach your desired crispyness. Cool completely and store in a glass container. To prepare glaze, whisk all ingredients together. 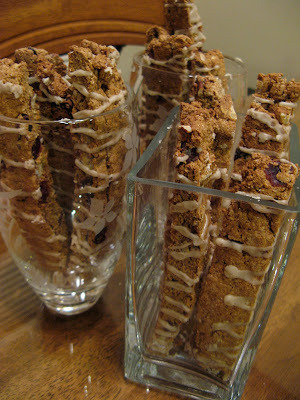 Place into a baggie, snip the tip, and "pipe" over the sides of the biscotti. 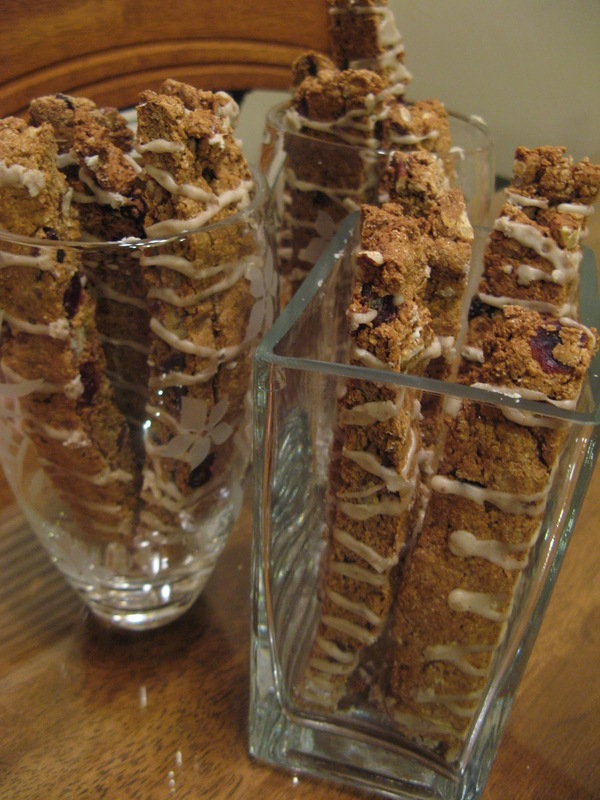 These were so good, and I can't wait to try making them very soon! Thanks so much for posting the recipe!